Much loved husband to Helen. I weep not that you have gone but smile you have been. In loving memory of Darrell William Hall, husband to Helen, father to Lee and Kasey. Father-in-law to Jason and Suzanne. Poppy to Emily, Charlie, Logan and also Ivy and Wookiee. The Funeral Service for Darrell Hall of Wannanup will be held at our Mandurah Chapel, 49 Pinjarra Rd, Mandurah on TUESDAY (02.04.2019) at 11.00am. Parking at rear of building. To our loving Darrell William Hall, Father to Kasey, Lee and Jason. You might be gone but remain forever in our hearts. Loving memories of brother-in-law and uncle to Phyllis and Tina. Deepest sympathy to Helen, Kasey, Jason and their loved ones. Thanks for everything Darrell. Rest peacefully. 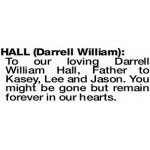 HALL DARRELL Deepest sympathy to Helen, Kasey and Jason. At peace and reunited with Lee. Love Frank and the Broz family.